Incognito mode is a great tool for Chrome users. Incognito Tab switch allows to switch current tab between incognito and normal window in one click. Incognito mode is a great tool for Chrome users. But it is little difficult to switch between normal mode and incognito mode and it can take too much time. For switching a normal tab to incognito, you'll have to copy the URL, than open an Incognito Window and load the page. 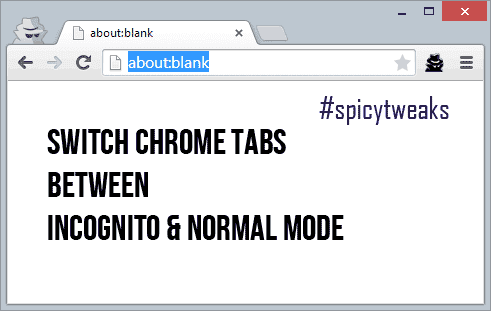 If you don't want that much hassle than try Incognito Tab Switch. This extension does the task of switching between the two very easily with one click. But, it will add a new button in the toolbar which you can click to switch between the two modes. If you have lots of extensions like Adblock Plus, OneTab, Click & Clean than your toolbar might be filled with too many button. Does this extension worth installing? Read below how it works. Tip: You can easily hide any buttons from the toolbar. Right click on the button and click hide, the button will not longer be visible in the toolbar. You can add the button back from extensions page. Hide one which you don't need from your Chrome Toolbar. 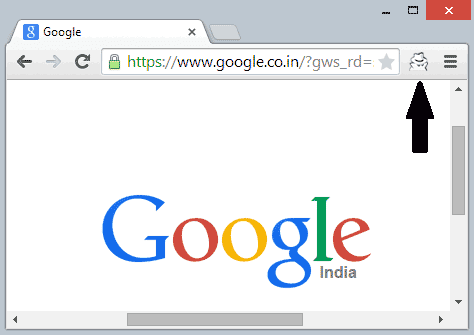 Sometimes while viewing the webpages, Does page stops responding and certain extensions have incompatibility issues? 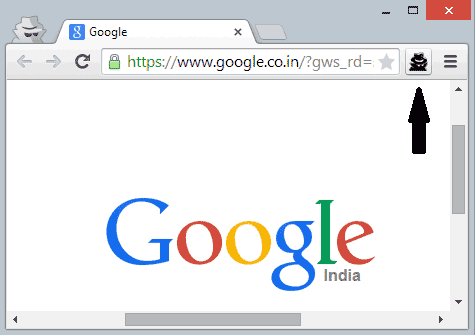 This extension allows to switch any webpage (or Chrome tab) between incognito and normal mode. Also, all the new instances of each tab are merged on the same Window and therefore you'll not have the hassle of switching between too many windows. Lets go through quick instructions to know how to use Incognito Tab Switch. Go to this link and install the extension. This link will take you to Chrome Web Store page. After installing, you'll see a new spy button appears on your Chrome Toolbar. This button will allow you to switch between the two modes. To switch the tab you're currently browsing to Incognito Mode, click this (spy) button, and Incognito Tab Switch will extract (or move) this tab to a new incognito window. If you want to switch more tabs to incognito mode, keep clicking the spy button on each tab and the tabs will be added to the same incognito window. When you're on a incognito window, than the spy button will turn dark. To switch the tab again to normal mode, click on the dark spy button, and the extension will extract/move the incognito tab to the normal mode on its correct position. But, Chrome automatically disables all the extensions when you switch to incognito mode. It means you'll not be able to switch that tab again to the normal mode easily. Don't worry! You can allow this extension to work in incognito from Extensions Manager. To allow this extension to work properly, you can allow permission to work in incognito mode by following the steps explained below. Scroll down until you find Incognito Tab Switch extension. Check (or click) allow in incognito. After allowing the extension on Incognito mode, it will work properly, and you can switch normal & private window easily in one click of a button. This extension currently only switch the normal tab to incognito and vice versa, but it will not remove the webpage from history which you're previously browsing in the normal mode.